Recent tornado situations once again have produced incidents where chasers have found themselves in danger from tornadoes, and narrowly escaped serious injuries or death. Then, to compound the irresponsibility of such actions, they post their "I'm in the tornado!" videos as a digital badge of their "courage". And they license such videos, hoping to get them aired - for a price, of course. I've talked about this at some length before, and expressed my concerns. But a recent Facebook post accused those critical of "extreme" chasers as being "haters", encouraging the posters of extreme videos to keep up their actions in the face of any criticism. Chasers unwilling to risk themselves by getting close to tornadoes are called "sissies" or worse. The particular subset of chasers represented by such extreme attitudes has been with us for quite a while. They rightly say we have no power to stop them from what they choose to do. I expect to change no one's mind with this blog. The loss of the Twistex chase team on 31 May last year in the El Reno tornado has sent a message to all chasers: even seasoned veterans trying to be as safe and responsible as possible (while trying to carry out an inherently dangerous mission) can make a mistake in certain situations. The El Reno HP supercell storm produced a large, "wedge" tornado, moving somewhat erratically, wrapped in rain. 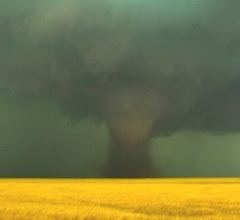 By getting in close to the mesocyclone where situation awareness became difficult, many chasers were putting themselves in danger and several had some narrow escapes, in addition to those who did not manage to escape. Many of us came away from that experience with the new (and old) lessons for safety becoming increasingly relevant to us in our chasing decisions. Many of us learned several lessons from the tragic outcome of 31 May 2013 - but of course, the "extreme" crowd has already demonstrated this year they have learned little or nothing from the loss of their friends and chasing colleagues. Some of those lessons were already known from the now decades-long history of storm chasing, some came from that terrible day. That some chasers would ignore these lessons was, unfortunately, a predictable response from that group of extreme chasers who consistently thumb their noses in defiance at anyone critical of their behavior, sneering contemptuously at those whom they label as "haters", and referring to them as "sissies" for not indulging in dangerous behavior of the sort they crave. They glorify doing dangerous things that could result in their fatalities and those who chase with whom they chase. This confirms the bias the media have in regarding storm chasers as crazy. It reinforces an image of chasing that's not appropriate for most of us. In effect, it's promoting an inappropriate stereotype applied to all of us. They encourage others to emulate their behavior, perhaps in hopes of achieving fame and fortune as a chaser, or perhaps just for the adrenaline. Real fame and fortune, of course, is just an illusion for all but a very tiny fraction of chasers who have marketed themselves as "extreme", only a few of whom actually know what they're doing well enough to become rich and famous for their exploits. If someone has video of a near-fatal encounter, the most valuable thing they could do with that is to use that footage to present and discuss what mistakes they made in getting into that situation, in order to help other chasers not to make the same mistakes. Several experienced chasers have done just that - admitting they made a mistake, accepting the responsibility for it, and then sharing that information in a way that helps other chasers. This is something extreme chasers never do, whereas many experienced, responsible chasers have already done so. Sadly, extreme chasers don't seem to want to use their errors to help others - it's all about them, not even remotely about the storms. Their actions speak so loudly, I can't hear the words they're saying.